Charity Village Feb 2013 – who are marketing volunteers? This is the first in a series of four articles that explain how to attract and manage marketing professional volunteers. If your image of a Professional Volunteer is a someone who approached you for personal reasons tied to your cause and that you treat as an “unpaid employee”, then I am going to ask you to set that image aside. This article is about professional volunteers that you recruit. You identify that you a have a specific project and you need specific expertise in a specific time period. You treat these volunteers like an “unpaid consultant” whom you pay in ways other than money. Everything in this series applies to for-profit consultants who work pro bono. But they are not the focus. Instead the focus is on recruiting professionals who are employees within the head offices of large corporations (or recently retired) who do marketing as their day job and are willing to help you out for a short time. You treat them like consultants, but you pay them in ways other than money. I am going to call them Volunteer Consultants. The majority of the candidates will want to put this work on their resume so they need a job title that is self-explanatory in the for-profit industry. Volunteer Consultants are what they do. Professional Volunteers are who they are. Two sides of the same coin. expertise that fills a gap – recruit marketers with the expertise you need. short term – you don’t need to nurture them over time like an employee. They do the project and then leave. You don’t need to find them something to do. unbiased third party – they can tell you the uncomfortable facts that your employees can’t. They can be honest with you because you can’t fire them. They have an outside perspective on how other outsiders see your non-profit. They won’t have any pet projects like a board member might have. Since you will work with them directly, you can manage the dissemination of the results as you wish. The focus of these 4 articles is on marketing and how to get marketing help. Many non-profits in Canada cannot afford full time marketing staff, but they still need marketing help. Here is how to find help. First you need to understand …. who are marketers? Marketers can be generalists or specialists. A general marketer will focus on the overall marketing needs for your non profit and must know a little bit about every aspect of marketing. Typically called Brand Managers, Marketing Managers or Product Managers, general marketers are usually employees within large corporations. When a general marketer needs extra help in certain areas, they call in the specialists. Specialist marketers are experts within certain marketing fields, eg graphic artists. Usually they are external consultants, but large non-profits may have employees performing the same functions. Why do you need a marketing generalist? There is always a risk in self-diagnosing your problem. You need to make sure you get what you need….. not necessarily what you originally asked for. A generalist will help you diagnose where your gaps are and either fill the gap themselves or find a specialist to fill the gap. For example, you may want “more donations” – a generalist will help you determine if you need more new donors or retain existing donors. Identify what marketing help you actually need and then recruit the marketer with the right expertise. Here is a menu of potential marketing projects for both generalists or specialists. As you can see, most marketing work can be done by marketing generalists. step 1 – select your project. If you don’t know where to start, do the Marketing Best Practices. step 2 – customize the sample job description in the link. step 3 – circulate your job description following the suggestions in the link. step 4 – prepare your own schedule. The figures in the Expected Hours column approximate how long your professional volunteer will need for each project. Expect your time commitment to be the same so you need to free up your schedule too. The hours are a minimum and could increase depending on the number of staff involved; a bigger team improves the quality of the outcome but can add hours. Lelia MacDonald is a Volunteer Consultant with MAS, a free consulting firm that serves Toronto non-profits since 1993. 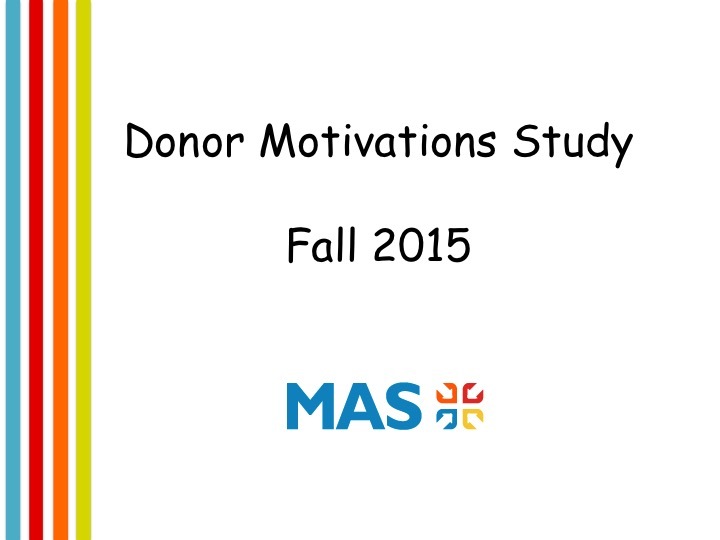 MAS is a charity with 40+ volunteer consultants that is funded by donations from satisfied clients. You can apply for help at www.masadvise.ca Lelia also has her own website, http://www.marketingfornonprofits.ca, and is available via Skype across Canada. Management Advisory Services is a consulting service that gives pro bono advice to Toronto non-profits since 1993. With 50+ Volunteer Consultants in governance, strategy, HR, marketing and fundraising, MAS is a charity that is funded by donations from satisfied clients. Our Volunteer Consultants are professionals who want to give back using the skills we learned in our careers. MAS mission is to build capacity in the non profit sector.